When war broke out in August 1914, University of Sydney medical graduate Nigel Boulton was training as a paediatrician in London and he promptly joined the Royal Army Medical Corps of the British Expeditionary Force. Back in Sydney, his younger brother Stephen left the Commonwealth Bank’s head office in January 1915 to enlist as an Artillery Gunner with the Australian Imperial Force. Both men were born in Australia of English parents. Both attended the British Orphan Asylum at Slough in England and The King’s School at Parramatta in Australia. Which country was home? Anglophile Nigel (Dearest Mother) has a strategic and medical view of the war. Aussie Stephen (My dear Matee) tells his day-to-day story of front-line artillery life, the ravages of dysentery and the trials of artillery officer training at Lord’s in London as he progresses to the rank of Lieutenant in the 2nd Field Artillery Brigade. The Boulton brothers’ letters to their widowed mother living in Sydney sweep from the outbreak of hostilities in Europe through Egypt and Gallipoli to Pozières and other major artillery battles on the Western Front, to the withdrawal of Australian troops in early October 1918, to the occupation forces entering Germany in December 1918. It’s rare to find a set of letters like these. The story of the Boulton brothers in the service of their country will stay with you long after you turn the last page. Six more hours would have changed everything. Review : A thoroughly captivating book that gives a first hand account of the horrors, anguish and sadness of all those involved in World War One. Such an interesting per perspective of Colonial Australia 100 years ago. I learnt many new things and gained an insight in Australian culture 100 years ago and Australia's involvement in WW1. Review : I found to my surprise really that I felt I knew these people personally after reading the book by Louise Wilson.I just couldn't put this down until I had finished it. I was struck by the detail of daily life of the men and those who loved them. 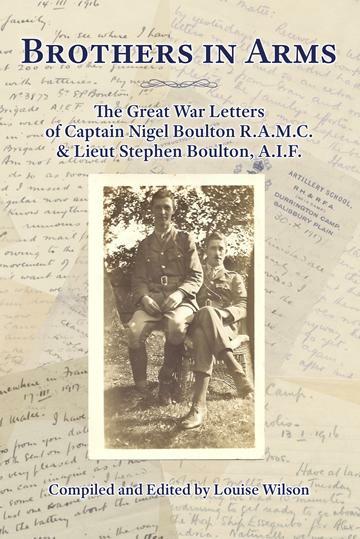 Review : On reading the first of the Great War letters written by the Boulton brothers, Nigel and Stephen, it became obvious that this was going to be an emotional, poignant and at times, disturbing journey. ...... Louise Wilson is to be congratulated on producing such a superb compilation of letters in this brilliant publication. Be prepared to shed a few tears. Review : The war letters of the two Boulton brothers, together with Louise Wilson’s bridging notes, paint a living picture of the Great War. The voices of the unseen women at home resonate too in these letters. The accounts of movements of men, medicine and machines make much in today’s world seem inconsequential. Two very different experiences of the Great War are both woven with the common threads of duty, self-deprecating humour, love, generosity and courage. These letters made me both laugh and weep – they make a memorable and moving book. Review : Through their letters, the Boulton brothers left a legacy of first-hand observations that add to the history of the Great War,and offer historians and general readers an engaging and moving story.